A short introduction to the course. In this lesson, we go over addition, subtraction, multiplication and division of rational numbers, especially with numbers written in fraction form. We also consider converting decimals to fractions and order of operation. In this lesson, we discuss and classify numbers as rational and irrational. In the second half of the lesson, we go over rationalizing the denominator of a fraction. This lesson introduces imaginary and complex numbers. We work on identifying the real and imaginary parts of a complex number and the conjugate of a complex number. We also plot complex numbers in the complex plane and finish the lesson with an example where we calculate the square roots of a complex number. In this lesson, we add, subtract, multiply and divide complex numbers. We also look at powers of i and solve an equation with complex coefficients. In this lesson, we represent complex numbers and their operations in the complex plane. We apply polar form to complex numbers and see how polar form is useful in multiplication and division and how rectangular form is useful in addition and subtraction. In this lesson, we cover the basics of vectors in Cartesian coordinates. We discuss operations with vectors and unit vectors. 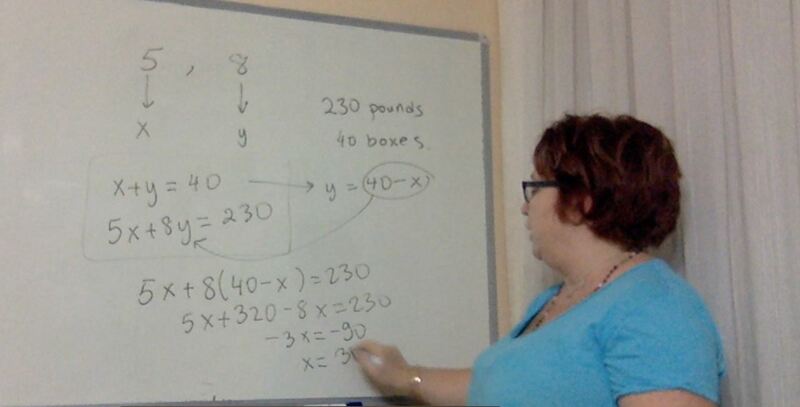 In this lesson, we work with vector quantities in solving real life problems. In this lesson, we look at operations on matrices and certain features of matrices. We cover matrix addition and subtraction, multiplication by a scalar and matrix multiplication. We also look at identity matrices, the dimensions of a matrix, square matrices and the transpose of a matrix. At the end of the video, we illustrate properties of matrix multiplication. In this lesson, we see examples of data with matrices, such as incidence matrices, payoff matrices and augmented matrices. We then look at inverse matrices and learn how we can find the inverse of a 2x2 matrix by hand. Lastly, we use the inverse of a matrix to solve a matrix equation. In this lesson, we look at multiplication of vectors with matrices and then we consider performing transformations on vectors using matrix multiplication. This exam covers material from lessons 1 through 10. The duration is 60 minutes. Good luck! In this lesson, we work with factoring the greatest common factor out of expressions and factoring trinomials, with a leading coefficient equal to 1 and not equal to 1. In this lesson, we learn and practice the division algorithm on polynomials. In this lesson, we go over the remainder theorems, the factor theorem, define zeros pf polynomials and sketch some polynomials based on their zeros and shape. In this lesson, we solve quadratic equations using completing the square and the quadratic formula. We also use the discriminant to distinguish between the number and types of roots. In this lesson, we look at polynomial identities and we use polynomial identities in solving polynomial equations. In this lesson, we apply the fundamental theorem of algebra to polynomial equations and graphs. We also consider multiplicity of roots in detail. In this lesson, we work with the binomial theorem to expand polynomials. In this lesson, we create one-variable equations (including absolute value) and systems of linear equations in two variables from contexts. We also look at solving literal equations. In this lesson, we look at graphing parabolas. We find the vertex and intercepts of a parabola and whether the parabola opens up or down. In this lesson, we graph systems of equations in two variables. We solve these systems and interpret the solutions geometrically. In this lesson, we create systems of inequalities from contexts and we solve these systems by graphing in the coordinate plane. Finally, we interpret the solutions in their context. This midterm exam covers the material in lessons 11 through 21. The duration is 60 minutes. Good luck! In this lesson, we consider the best unit to use in different problem solving contexts. We also look at scaling in graphical displays and the significance of slope and y-intercept in a context involving a linear equation. In this lesson, we define special quadrilaterals and look at their properties. We prove some of these properties and also use the properties to solve problems. In this lesson, we look at the Pythagorean Theorem and its converse. We also consider the situations where the side lengths given belong to an acute triangle, a right triangle or an obtuse triangle. In this lesson, we will be working with theorems that apply to angles and segments in circles. In this lesson, we calculate arc length, areas of sectors and central angles using the fact that a sector encompasses a fraction of a circle. In this lesson, we look at the six trigonometric ratios in a right triangle. We solve for missing angles and sides in a triangle and we also apply these ratios to problems involving angles of elevation and depression. In this lesson, we learn about metric and US Standard units of mass, length and volume. We also perform conversions between these units. In this lesson, we learn to calculate surface areas of solids, such as cubes, prisms, cylinders, pyramids, cones and spheres. In this lesson, we learn to calculate volumes of solids, such as cubes, prisms, cylinders, pyramids, cones and spheres. This final exam covers all the material in this course. The duration is 120 minutes. Good luck! This course builds on the math skills you have developed in grade 9 to provide an integrated comprehension-based and problem-solving centered approach. Over 10 hours of video-lessons! Each lesson includes a video lecture, a worksheet, a worksheet review video and an online quiz. This video-course is primarily intended for 10th grade students who would like to enhance their mathematical skills and knowledge in the integrated Mathematics curriculum. Students taking this course will need to have completed Math for 9th grade or an equivalent Math course prior to enrolling in this course. I am happy to start working with Lernsys students as I reach out to you all beyond the physical boundaries of the classroom.